The main Decred (DCR) staking pool hasn’t been accepting new registrations for quite a while, but now more staking pools are expected to soon be available. The first from the new wave of DCR staking pools is from Stakeminer that is already running on the mainnet with a few more still on the testnet that should soon also become available of the main Decred network. 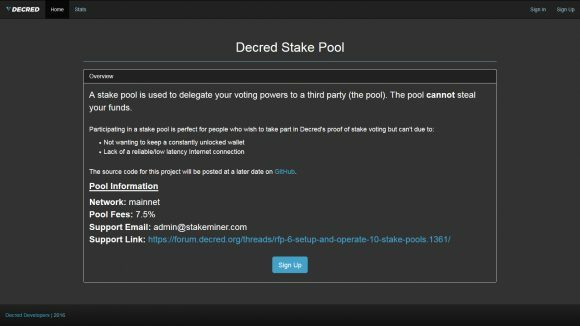 The Decred Stake Pool from Stakeminer is currently running up with a 7.5% fee, but it will probably get lower once more pools are available and DCR holders have more options for staking without having to run their wallet 24/7 locally. So you can check out the new Decred staking pool that is taking new registrations now and stay tuned for more pools that should be coming online pretty soon. Update: There are now two more DCR staking pools online now, http://stakepool.eu and https://dcr.stakepool.net both running with a 7% 5% fee. There is also yet another staking pool available now also with the lower 5% fee – http://pool.d3c.red and now there is yet another one online with 5% fee – https://stakepool.dcrstats.com.